I idealized becoming a mother. Who doesn't? It an amazing gift in whatever way it comes. I’d dream about holding a cute baby girl and cuddling her sweetly. My first pregnancy was a cake walk - literally! Along with the pregnancy glow, I gained an extra 50 pounds! In my quest for the perfect natural birth, I took not just one but two birthing classes! Little did I know I was heading into an identity crisis. The dictionary says an identity crisis is a period of uncertainty and confusion in which a person's sense of identity becomes insecure, typically due to a change in their expected aims or role in society. For me that was becoming a mom. Let’s just say my dreams of motherhood did not match reality. What happened was not in any way the a blissful-natural birth I pictured. The first two weeks of having baby Mckenna home went by pretty smoothly. But I was not prepared for the weeks and months to follow of feeling helpless and a like failure at being a mom. I had all these ideals in my head of what being a great mom looked like and that is just not what reality bought. Now I was home all day, sleep deprived, still looked four months prego, nursing a baby ALL day, and watching ER re-runs. I could barely shower and get dressed let alone make a meal for my family. I didn’t know who I was anymore. We all have asked ourselves - Who am I? We all identify ourselves by something or someone. Whatever we choose to be our identity we are hoping it will bring us life! The problem is that our sin nature without intervention will keep us running to all the wrong places. What if we thought of our lives like a small, pretty flower. Let's go with this illustration for a minute. We are all looking somewhere to place our identity. A plant needs a place where it can put down roots and grow. 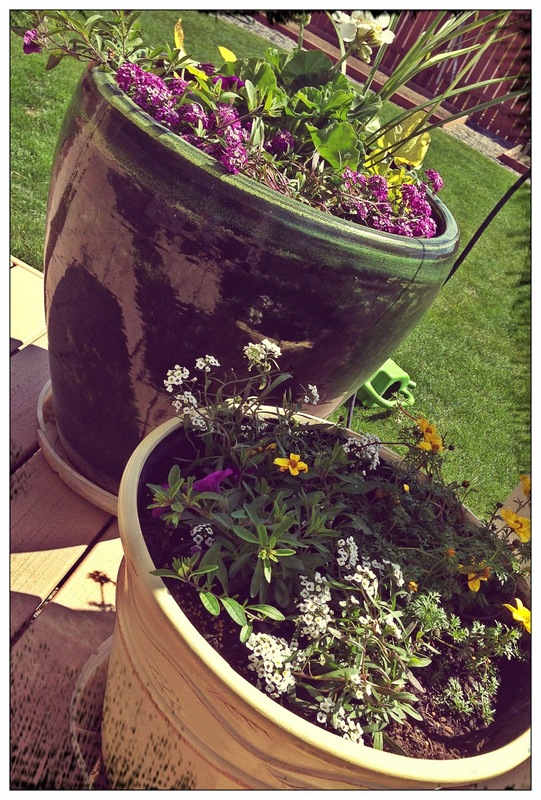 What if finding our identity was like planting our lives is different flower pots. God made us for relationship with him and with others. The problem is we can root our identity in who we know. There will never be a relationship that I can find or there will never be enough relationships to tell me “your loved.” Because this pot is empty is will ALWAYS leave me needing more love. How can we know if we are rooting our identity in relationships? How do you react to rejection from others? Do you regularly name drop to others? What is your response to failure? Do you causally hint about your success? Do I go to excessive lengths to pamper my looks? Do I often become depressed appearance? We can root our identity in what we have or what we don’t have. If I’m letting my identity be placed here then I’m always going to be letting what I have tell me I’m significant. And what I have will NEVER be enough. I'll always need more. Do you...? Do I continue to purchase things that I don’t need? When I see someone with something I’d like, where do my thoughts go? Does is matter how you serve or are you happy just to serve? Do you label some serving as more important than others? We can root our identity in health problems. We can let our sickness or handicaps define who we are. This pot is empty too. If I place my identity in being healthy or define it by a handicap, I’ll always be looking for “getting better.” I’ll become a martyr to my situation. What’s a sign that we find our identity here? Is your health troubles one of the first things people know about you? Do you find yourself thinking life would be better if ________? "I’ll never be good enough because that happen to me or because I did that." "No one would ever love me if they knew about my past." These are just seven places that I have misplaced my identity. There are many more. I share these ones because I have battled not finding my identity here. 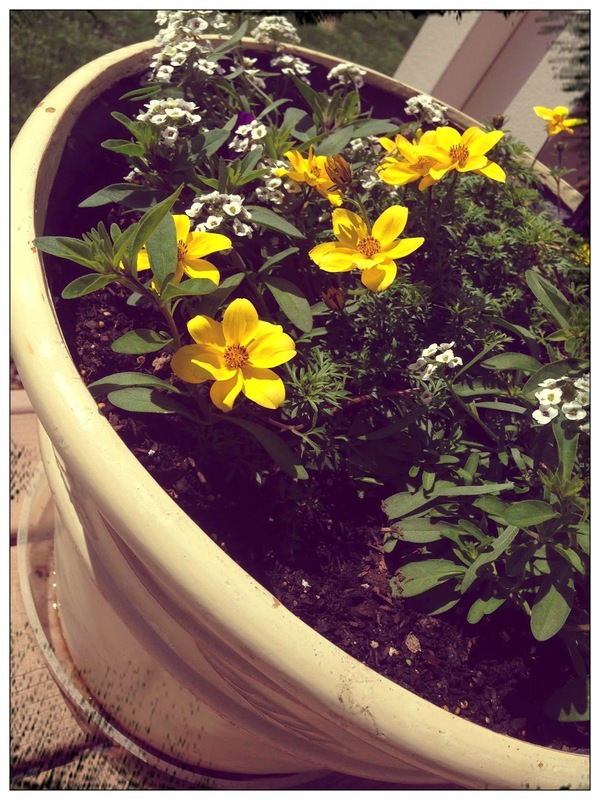 A beautiful flower pot can look appealing and promising but it is empty. Each time I have placed my identity here it has left me wilted and thirsting for more. You see when we let these things say who we are then we begin comparing. The dictionary says comparing means to examine in order to find similarities and differences. If I’m identified by my success, I”ll always be measuring mine to others. If I’m identified by my appearance, I’ll always be looking at other girls and thinking I could dress better, have a better body, have a better personality. If I’m identified by possessions, I’ll always compare my house, my car, my clothes my vacations to others. If I’m identified by my ministry I’ll always compare mine and think it’s not as significant as others. If I’m identified by my health, I’ll always compare mine to others. If I’m identified by my past, I’ll compare mine and I’ll feel broken and helpless. These are not bad things. These are not evil. But they were never meant to be places that we find who we are. This is not were we are to plant our lives. But there is a place where our roots can grow deep and our lives can flourish. Only by placing our lives in Christ can we find a lasting identity. His Spirit and His truth is what our lives need. Let's choose to grow our lives deep in the soil of Christ's love. Not in these other things. His Love -- that only place where our roots can go down deep. I have had this idea in my mind for some time. Once as a young girl, my mom took my sister and I to a High Tea. It was a special afternoon that we shared - sipping tea in fancy hats. As I've matured as a mom, I've come to see more and more that each mom has their own special way of being mom. The mom that is just right for the children you have been blessed with. I'm learning to celebrate what are my strengths and incorporate that into my children's hearts. 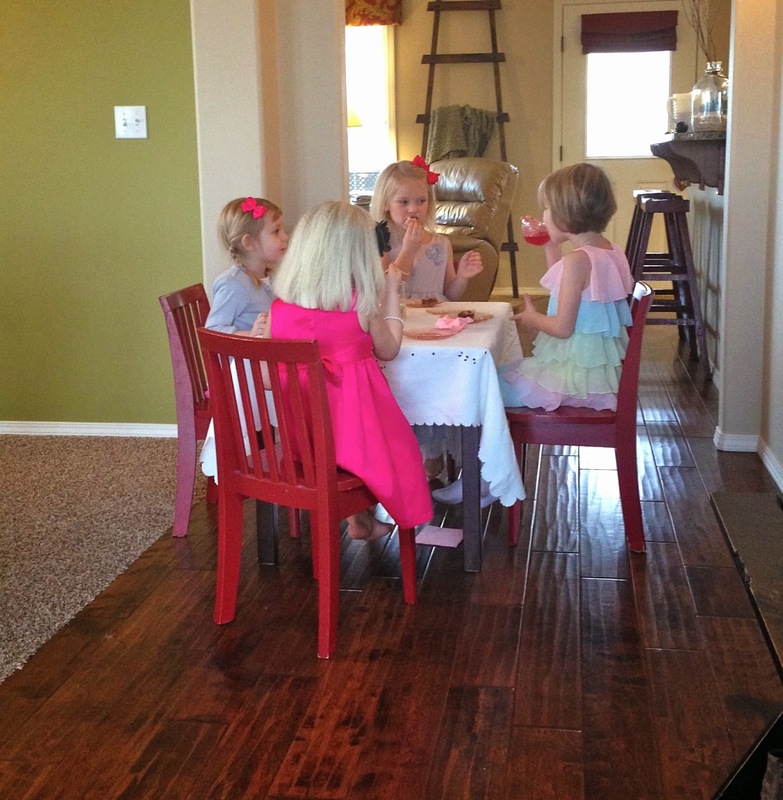 That is were the idea for Tea Parties with my daughters began. Here is what it has looked like so far. We invite two friends, one for each of my girls. We choose a menu for our guest. So far its been one savory and one sweet recipe. Nothing fancy just something simple that the girls can make with me. We set the table together. I chose a fun tea set that would grow with my girls through the years. 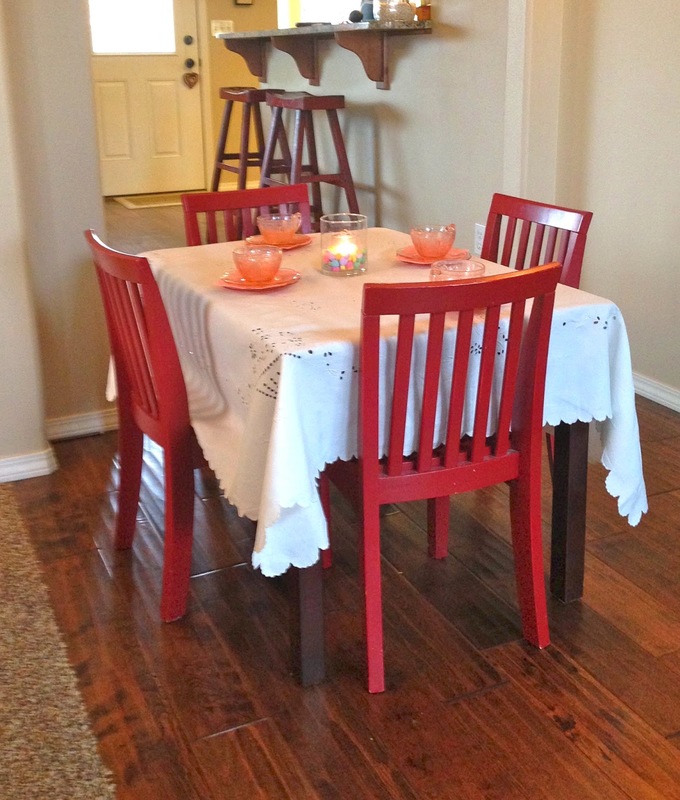 We place the table cloth, dishes, and center piece. We get all dressed up. 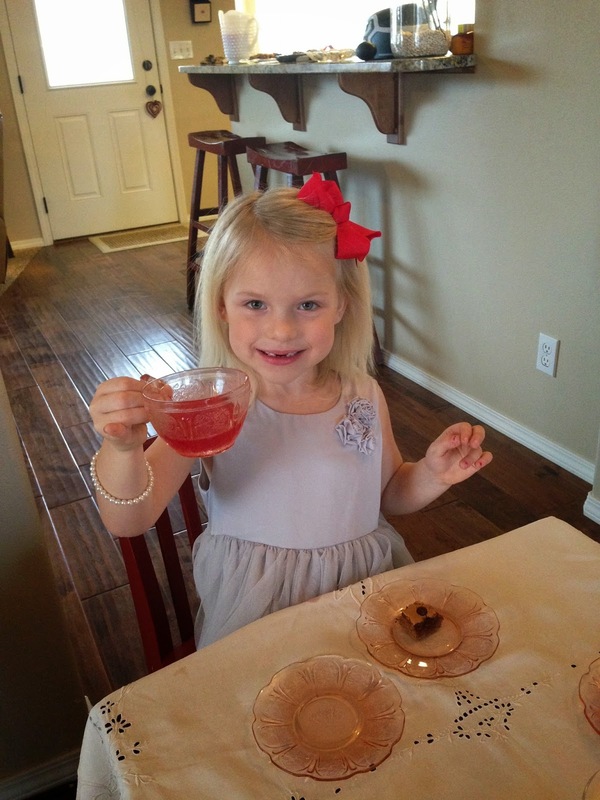 What could be more fun than an afternoon of dress up and tea with friends. Enjoy tea time with friends. This has been a great way for me to teach my daughter's simple manners and etiquette, something that seems to be a lost art these days. It's been my goal to have one once of a month with my girls. We've come pretty close. I love knowing that I'm investing in my daughters in a way that incorporates who I am as a women and mother. 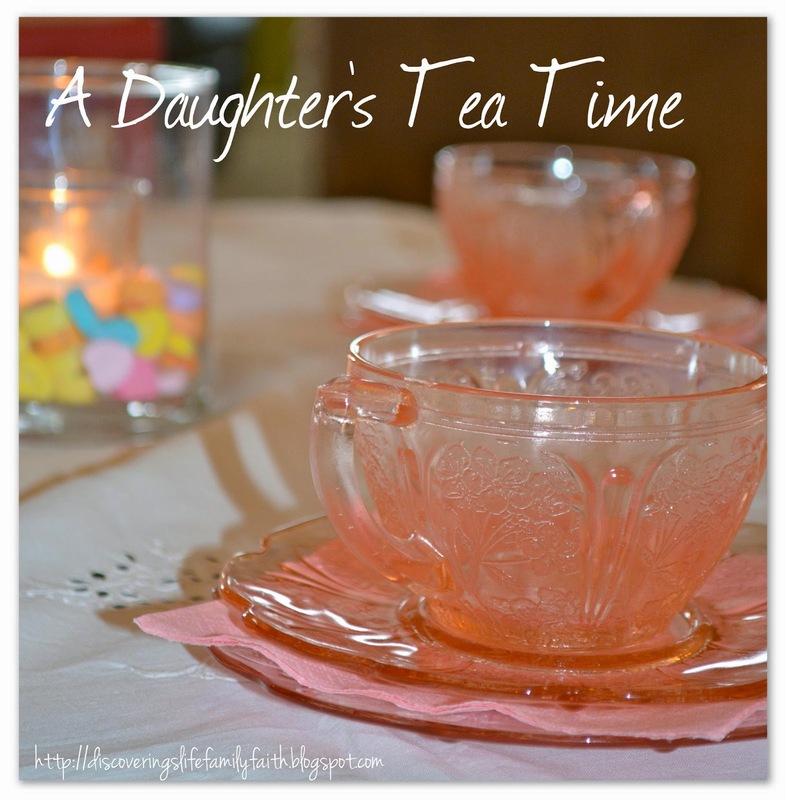 The memories we are making with my daughter's tea time will be treasured for years to come.